Recombinant fragment corresponding to Human MAP2. Mix of recombinant human constructs of projection domain sequences, amino acids 235-1588. Lipid extraction from egg yolk, followed by ammonium sulphate precipitation. Our Abpromise guarantee covers the use of ab5392 in the following tested applications. WB 1/100000. This 280kDa band corresponds to the high molecular weight MAP2a and MAP2b isoforms. Also detects 2 bands at approximately 70 kDa, corresponding to MAPc, since the 70kDa bands are transcripts from the same gene and correspond to the C-terminus of the 280kDa bands. PFA-fixed, paraffin embedded sections of sheep cerebellum were stained for MAP2 with ab5392 at 1/2000 dilution in immunohistochemical analysis. Goat Anti-Chicken IgY H&L (Biotin) (ab6876) was used as secondary antibody at 1/200 dilution. 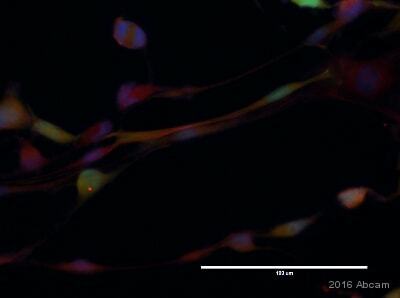 Rat E20 cultured cortical neuron-glial cells stained for MAP2 (red) using ab5392 at 1/2000 dilution for ICC/IF. 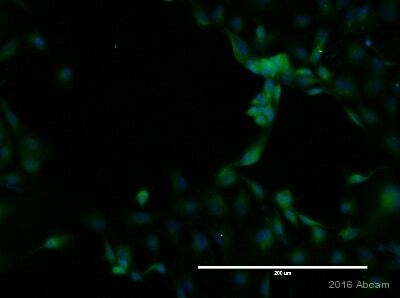 Tau is detected with a mouse monoclonal anti-Tau antibody (green). 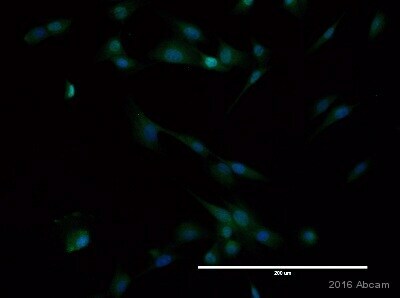 The nuclear counter stain is DAPI (blue). 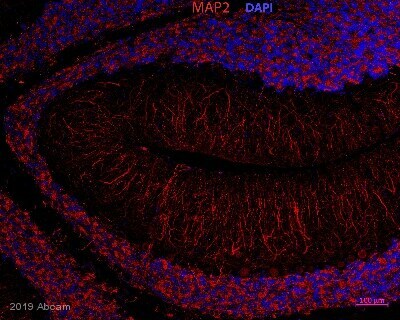 Overlap of MAP2 and Tau staining results in an orange-yellow color. Immunohistochemistry (Formalin/PFA-fixed paraffin-embedded sections) - Anti-MAP2 antibody (ab5392)Image courtesy of an anonymous Abreview. ab5392 staining MAP2 in murine brain tissue sections by Immunohistochemistry (PFA fixed). Boiling in citrate-buffer was used as antigen retrieval method. ab5392 used at a 1/2000 dilution for 12 hours. The secondary used was an Alexa-Fluor 555 conjugated goat anti-chicken polyclonal used at a 1/400 dilution. ab5392 detecting MAP2 recombinant protein by direct ELISA. Mouse recombinat protien was coated on to microplate in carbonate coating buffer pH 9.6 for 1 hour at 37°C, Plate were blocked with 3% BSA for 1 hour at 37°C and incubated with the primary antibody (1/5000 in PBS + 1% Tween-20) for 1 hour at 37°C. An alkaline phosphatase Goat anti-chicken IgG polyclonal (1/100000) was used as the secondary antibody. PFA-fixed, paraffin embedded sections of rat brain were stained for MAP2 with ab5392 at 1/4000 dilution in immunohistochemical analysis. Goat Anti-Chicken IgY H&L (Biotin) (ab6876) was used as secondary antibody at 1/200 dilution. 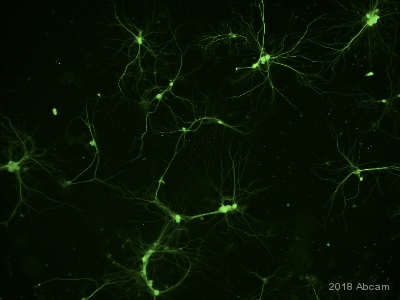 ab5392 at a dilution of 1/10000, staining MAP 2 (green) in tissue cultured rat cortical neurons by immunofluorescence. Nuclei are stained blue with Dapi. 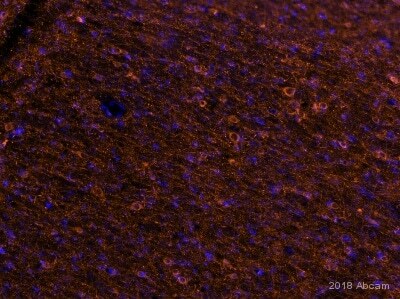 Rat cortical neurons and glia in mixed tissue culture stained with ab5392 (Chicken antibody to MAP2) (green)(1:30 000), a mouse monoclonal antibody to GFAP (red) and nuclei of all cells stained with Hoechst dye (blue). ab5392 staining MAP2 in rat spinal cord tissue sections by Immunohistochemistry (PFA perfusion fixed frozen sections). Tissue samples were fixed by perfusion with paraformaldehyde and permeablized with 50% Ethanol for 30 minutes. The sample was incubated with primary antibody (1/250 in PBS + 0.3% Triton X-100) at 4°C for 48 hours. An Alexa Fluor® 488-conjugated goat anti-chicken IgY polyclonal (1/1000) was used as the secondary antibody. PFA-fixed, paraffin embedded sections of dog brain were stained for MAP2 with ab5392 at 1/2000 dilution in immunohistochemical analysis. Goat Anti-Chicken IgY H&L (Biotin) (ab6876) was used as secondary antibody at 1/200 dilution. ab5392 at 1/5000 staining PFA fixed free floating sections of mouse brain. 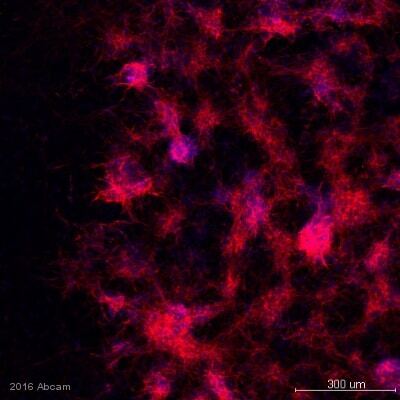 An Alexa Fluor® 633 conjugated goat anti-chicken antibody was used as the secondary. ab5392 staining MAP2 in mouse neurons by immunocytochemistry/ immunofluorescence. Cells were PFA fixed and permeabilized in 0.4% Triton X-100 prior to blocking in 5% serum for 1 hour at 25°C. The primary antibody was diluted 1/10000 and incubated with the sample for 20 hours at 21°C. Alexa fluor® 488 goat polyclonal to chicken IgY, diluted 1/400, was used as the secondary antibody. Publishing research using ab5392? Please let us know so that we can cite the reference in this datasheet.